SuperSpeed Compact USB 3.1 (USB-C, USB Type-C) Micro SD / TF / T-Flash / SDXC / SDHC Card Reader : allputer.com - Accessories for all your Portable Electronics & Computers! A Simple Card Reader for your Memory Cards, it is a must for all photography lovers, this probably is providing you the lowest cost solution. 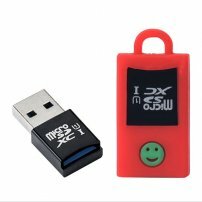 - USB 3.1 SuprSpped, fast transmitting, compact in size, light weight!